Quadcopters are incredibly popular, but with so many options on the market it can be tricky to find one that ticks the right boxes. If you’re stepping up from a palm-sized “toy” quadcopter for the first time, or want a device with a mounted HD camera, then the Syma X8HG is both a suitable and affordable choice. It’s available from GearBest for a little over $100 at the time of writing. Upon unboxing the Syma X8HG quadcopter, you’ll find a collection of blades and tools, along with the 2.4 Ghz controller, mounted in a white polystyrene packaging block. So where is the quadcopter? Well, it’s underneath, which means you need to be extra careful removing the block from the box, lest the quadcopter slip out and hit the floor. Within, you’ll also find an instruction guide, which appears to have been written with the aid of Google Translate Travelling With Google Translate? 4 Tips To Improve Your Experience Travelling With Google Translate? 4 Tips To Improve Your Experience If you plan on travelling to a foreign country anytime soon, Google Translate can really help you, but it has its limitations. Here's how to best make use of this wonderful app. Read More . This is less than ideal, but I hope to be able to fill in the blanks for you in the course of this review. The camera is a Syma X8G, a lightweight, 8 MP, GoPro-style Buying a GoPro or Action Camera: 7 Useful Things You Need To Know Buying a GoPro or Action Camera: 7 Useful Things You Need To Know If you're into skiing, cycling or surfing, then an action camera is the perfect way to record your adventures. Read More sport camera that is clipped to the underside of the quadcopter and draws power from the unmanned vehicle to take photos and video. Before you can fly the Syma X8HG quadcopter, you’ll need a few things. First of all, charge the battery using the adaptor, and slot 4 AA batteries into the controller so you can keep control over the craft on the 2.4 Ghz wireless frequency. While charging, flip the quadcopter over and attach the four stands, each with two screws. You should then follow the instructions in the guide to attach the four blades, making sure that you connect them to the matching motor. Blades are in pairs, and labelled A or B, with one pair for rotating, and the other for reversing. Be sure to match the label with the correct motor, otherwise you’ll have some problems controlling the craft! Before attaching the camera to the craft, you’ll need to insert the battery. Make sure the power is set to Off before doing so. It’s also a good idea to go for a test flight without the distraction of the camera, certainly before you start your career as a drone racer Drone Racing Is Here! 5 Things to Know Before Getting Started Drone Racing Is Here! 5 Things to Know Before Getting Started Drones are taking over every industry and sports are no exception. Here's everything you need to know about this up-and-coming activity and how you can get involved. Read More ! Build Quality: Will It Last? I’ve heard of several quadcopters failing to see out a month, partly because the build quality is poor, and of course because the pilot wasn’t up to the task! The Syma X8HG isn’t built from rubber. While it is durable and can cope with sudden landings and occasional streetlights, you’re not going to get away with mistreating it. The device has four powerful motors on board, and making a serious error when piloting the craft can result in some irreparable damage. When taking a craft like this out for a fly, you need to make sure that the environment is relatively uncluttered, and that the surface is suitable for landing. Beaches aren’t great, thanks to the likelihood of sand finding its way into the quadcopter’s motors, but they do at least offer a lot of open space (away from the sea, of course!). The preference for beginners should be a field or waste ground, with plenty of relatively soft grass for the Syma X8HG to land on, controlled or emergency! Flying a quadcopter is like playing a marshmallow guitar for newcomers. You are seriously advised to get your wings with some smaller models – the palm-sized craft that you can pick up in a gadget or toy store for under $50 10 Tech Gifts for Dad That Are Under $50 10 Tech Gifts for Dad That Are Under $50 Getting an awesome gift for Dad doesn't have to burn a hole in your pocket. Here are some amazing ideas that won't cost you more than $50. Read More – before graduating to something as big as this. Once you’re ready for the full sized drone experience, there are various things that you need to consider, such as calibrating the craft on a level surface, or using the trim adjustments to counteract any drift in the craft as it takes to the air. However, in good conditions, with the device correctly calibrated, you should be able to take advantage of some of the automated functions, more of which below. Furthermore, good conditions make the Syma X8HG easy to fly, and as long as the battery is fully charged, you’ll enjoy some impressive speeds and fast responses as you steer the quadcopter, record videos and take photos, and perhaps even strafe the local wildlife. Want to record some aerial footage? The 8 MP camera records in two HD modes – 720p and 1080p – so once you’ve become familiar with the controls, find the switch to the right of the left-hand control, and hold it down until you hear a beep. This should start the camera recording in video mode — the camera’s green light should switch to red — but be sure to hit the switch again before you switch off the quadcopter (or the battery runs out), otherwise the file won’t be saved. There is also the option to take still photos, which you can do with a quick press of the same button. This is trickier to do with good results, however, so you’re best using the video option and capturing single images from that. Picture quality is satisfactory, but a long way from the pinnacle of drone photography Latest Drone Photography You Have To See To Believe Latest Drone Photography You Have To See To Believe Drone photography is an exciting new technology that allows anyone to take awesome aerial videos. This article runs down some of the best on the internet. Read More . Of course, the downside of that is that more of your quadcopter’s battery life will be used. Photos and videos can be exported from the camera via the microSD card, which comes with an SD card-sized adaptor for easy insertion into a PC or laptop. Check out the review video for sample footage. Okay, here’s the rub. Around 95% of reviews for this particular device specify FPV. 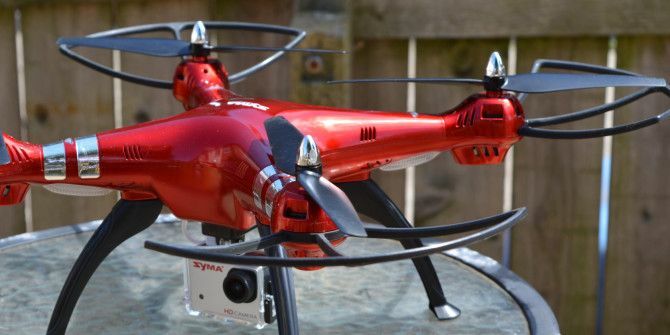 The thing is, the Syma X8HG doesn’t have FPV. As is standard for quadcopters — particularly those from Syma — several iterations of the same model, all with the X8 prefix have been released. Some of these (such as the X8HW – the “W” meaning Wireless) do have FPV, which means that you can see what the mounted camera sees, a sort of “pilot view” on your mobile device — but not the model we’re reviewing here. In fairness, with so many similar model names in use you can see where the confusion might arise. But we’ve double checked, re-read the instructions and checked the features across the range at www.symatoys.com, and can confirm that the Syma X8HG does not ship with FPV functionality, or a compatible controller. The Syma X8HG comes with a bunch of automated, one-touch controls options, which remove the need to learn complicated control combinations. Overturning: with a freshly charged battery, and once the craft is over 5 meters above the ground, the right-hand shoulder button, in combination with the right-hand joystick pushed front, back, left or right will initiate an overturn looping maneuver in the selected direction. Altitude barometer: this hover feature basically sets the drone in a stationary hover. Previously this kind of feature was only found on more expensive models, but can be easily enabled by centering the left joystick at the preferred height. As long as the level calibration has been set, this feature works well, especially if you want to record videos or take photos. Headless mode: some drone pilots find this useful, as it enables you to instruct the quadcopter that the direction it is “facing” when headless mode is activated is the “front” of the craft. It’s useful to know this for aerial photography, for instance, but if necessary this feature can be disabled. With headless mode disabled, you use the craft’s lights to distinguish between front and back. Lights: okay, so they’re not exactly secrets as you can spot the LED covers on the underside as you’re setting the quadcopter up. However, they allow the drone to communicate with you at distance. For instance, a rapid blinking means that the device battery is low, and needs a recharge (which is why you should invest in additional batteries). Lights also enable you to see the drone at night, although in fairness, it’s perhaps other objects that you need to be aware of! The Syma X8HG is a well-built, affordable quadcopter drone (available for under $150) that is fast, reasonably responsive and equipped with a good quality GoPro-style sports camera. While it doesn’t come with the FPV features of other Syma quadcopters, it has simple to assemble blades and will automatically hover if correctly set up. Love the Color! thanks for the chance of winning! Red for speed and class. Superb. Love the specs! Would make an awesome addition to my family, thanks for the chance! Holy Batman. Pick me, pick me! Your next winner!!! Show me the money!!! It would be a dream come true and means more to me than anyone else to win. Starving artist here desperately needs the drone to work and eat. Winner, winnner. Chicken dinner. A life changing experience. Top of my bucket list. Thank you for the awesomeness, the contest, and generosity. Dear Santa: I’ve been nice. My X-Mas wish this year is to win this contest. Sounds like a great Quad-copter. The Syma X-5C was easily user modifiable with a lot of youtubes videos on doing so. I suspect this one will probably have the the ability. Our Facebook guy is a bit slow. Check tomorrow, sorry! Still didn't see a Facebook vid.